In this paper, the motion and acceleration process, as well as the mechanism of a high speed and long run landslide are investigated by adopting high speed ring shear test and taking the landslide occurred at Yigong River in Bomi, Tibet on April 9, 2000 as the background. According to the motion characteristics of high-speed and long distance motion landside, the mechanism is studied under different conditions such as shear speed, consolidated drained and consolidated undrained status. Results show that high speed shearing process hinders and delays the dissipation of pore pressure, and drives pore water migrating to shear zone slowly. Both of water content and fine particle content at shear zone are obviously higher than those in other layers; and soil liquefaction occurs at shear zone in the saturated consolidated undrained ring shear tests. The effective internal friction angle of the consolidated undrained soil is much lower than that of the consolidated drained soil under ring shearing. The results also indicate that the shearing speed affecting the strength of soil to some extent. The higher the ring shearing speed is, the lower the strength of soil is. 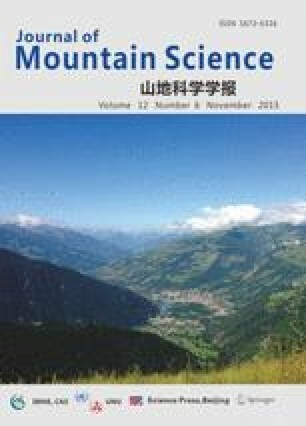 This investigation provides a preliminary interpretation of the mechanism of the motion and acceleration process of the Yigong landslide, occurred in Tibet in 2000.